On February 14, 1989, Iran’s Ayatollah Khomeini issued a death threat against British author Salman Rushdie, author of the controversial novel The Satanic Verses. This edition of Salman Rushdie's controversial novel The Satanic Verses is Iranian—and therefore illegal. 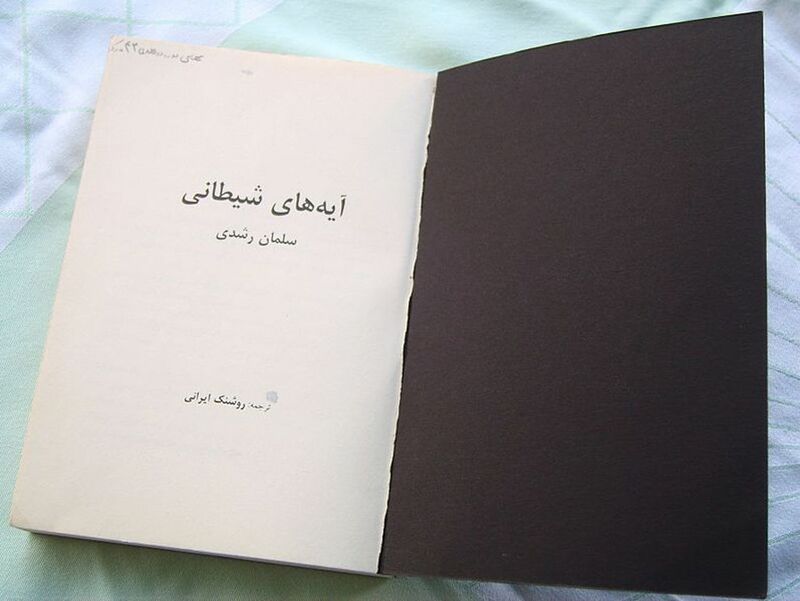 A death sentence was issued against Rushdie from the Iranian Ayatollah Khomeini in 1989, and although the government has withdrawn support for Rushdie's death, the book is still banned. Photograph by Olaf Simons, courtesy Wikimedia. This file is licensed under the Creative Commons Attribution 3.0 Unported license. On February 14, 1989, Ayatollah Khomeini, leader of the world’s 200 million Shiite Muslims, issued a fatwa condemning British author Salman Rushdie. A fatwa is a legal judgment issued by a Muslim scholar. This fatwa was a death threat issued against Rushdie, who had recently published his fourth novel, The Satanic Verses. Rushdie went into semi-seclusion for ten years and was never injured. Bookstores in the United Kingdom and the United States were bombed, however, and dozens of people died in anti-Rushdie incidents in Pakistan, India, and Turkey. The book’s Japanese translator was stabbed to death, while its Norwegian publisher was shot. The government of Iran withdrew support for Khomeini’s fatwa in 1998, although Khomeini’s spiritual successor, Ayatollah Khamenei, has upheld the death threat. title for an elite Shia (or Shiite) Muslim leader. to sentence someone to punishment. fatwa Noun legal judgment on a point of Islamic law given by a recognized religious authority. holy book of the Islamic religion. branch of Islam that honors Mohammed's son-in-law Ali. Paper Money Introduced in U.S.